THE German state railway Deutsche Bahn is reported to be in urgent talks with the Department for Transport over revenue shortfalls at the Northern franchise. The franchise has suffered this year from the failure of its May timetable. It blamed late-running electrification work for some of the disruption, when plans to run electric trains had to be abandoned at short notice. It is also embroiled in a bitter dispute about on-train staffing with the RMT, and a series of 24-hour strikes is continuing. The Daily Telegraph claims that DB is trying to renegotiate the subsidy profile included in the contract. Under the terms agreed by DB’s subsidiary Arriva, the amount of subsidy is suppose to fall each year, but the continuing disruption on Northern has dented predicted revenues, and the subsidy has allegedly risen to £282 million this year. The Department for Transport has refused to confirm or deny the reports of spiralling losses at Northern. A spokeswoman told Railnews that ‘we do not comment on financial discussions with franchise holders’, although she did confirm that the Department has regular meetings with all franchisees. She was unwilling to be pressed further on what those meetings involve, even in principle, although it is already known that each franchise has an effective ‘account manager’ within the Department who is the key contact. The RMT has been demonstrating outside Parliament in London today on the 25th anniversary of the 1993 Railways Act, which legalised privatisation. The union has just announced more strikes on Northern on every Saturday until the end of the year. RMT general secretary Mick Cash said Northern is a ‘basket case rail franchise sucking up well over a quarter of a billion pounds a year in public bail-outs while wrecking service standards, ripping up the safety rule book and threatening to throw the guards off over half their trains. This scandal needs to end immediately and that means the Government taking immediate action to bring the Northern routes into direct public ownership and control with the services run on the basis of safety, security and access and not private profit. That means a guard on every train and proper staffing at station level as well. 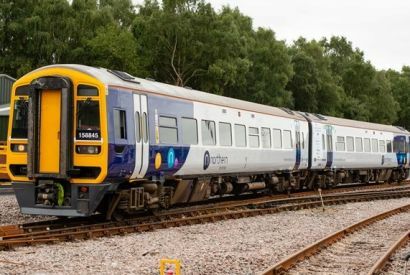 ‘With reports that TransPennine Express are in similar dire straits this national disgrace on our privatised railways, coming exactly 25 years after the Act was passed ushering in the Great British Rail Rip-Off, has to be called to a halt before irreversible damage is done. Railnews asked the Rail Delivery Group to comment on Labour and RMT claims that rail fares have risen by 20 per cent in real terms since January 1995, but it has not done so.